Going on an adventure with Lil D and his 5 buds. Awesome! Thank you a ton for doing this and if you ever need it for an event I'm happy to do live support for it. 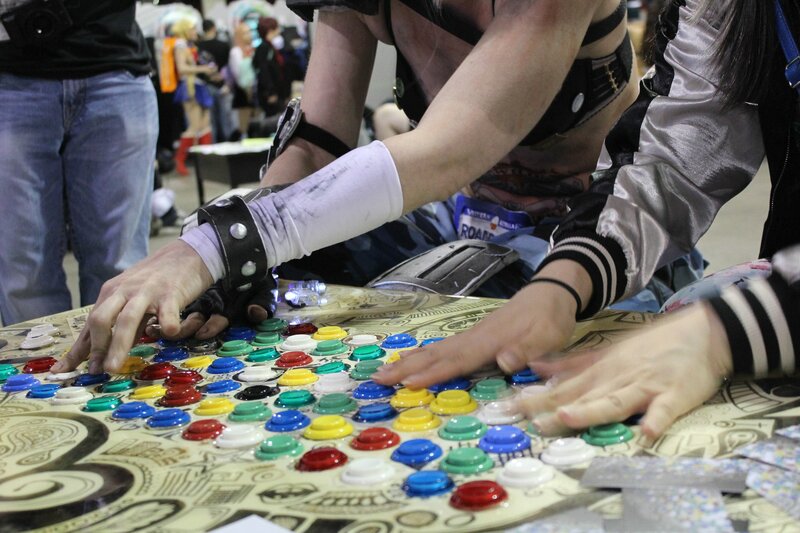 If you're interested in weird alternative hardware games, then you can definitely check out my game Centenntable, which is a 100 button game usually played on a custom fight stick (the moves randomize every round!) but not everyone has a 100 button fight stick -- silly, I know, I have two. But on the off chance that you don't have one, we have a customized version of the game released only on itchio that you can play with 4 USB keyboards! So mash to your hearts content and please, if you play it, let me know! I'm on Twitter at @barelyconcealed and I really do love nothing more than talking about this game. Its mostly been a board rehaul and checking our streaming set up, so don't despair if you missed out. We're going to do a few more of these over the month. From a practical standpoint, I'm not sure how to add shapes to each color on the board itself (since stickers or paint would wear down pretty quickly over repeated use). This is a prototype board though, so it is something I would like to keep in mind for the future. I'm looking at doing an afternoon playtesting stream with the board on Sunday 9/17. I'm hoping that will give people an opportunity to test out any functionality they may have, and to give you all a chance to ask questions about layout etc. I'll try to have some people on hand locally so we can test any multiplayer experiences people may have made. Please let me know if there is a specific time you are thinking would work best? I'm thinking a 2 hour stream starting around 3:00 PM EST. The games we were developing didn't require it, but we'll add it to the Arduino code. Here is the sample project for Unity, which includes the code that will be used for connecting games to the board. Please let me know if you need any further information. Additionally, we are having some minor issues with the configuration of the board so that file will need to be updated soon! For now there is a version of that configuration file in the project, it is just not the final one. With all the jostling of traveling cross country, we have to do some minor hardware fixes before we can update the software, and that process will not be completed until early next week. 1. We didn't do a Matrix because we didn't know a way to do a matrix that would allow for simultaneous presses, which seemed important for this board. A matrix would probably be a more efficient system, which actually feeds into the second reason. 2. It was super cheap and relatively straight forward to do it the way that we did. I'm using Elegoo Mega 2650's, which are $12 a piece and with a docking station attachment I also don't have to soder. I have a pile of I/O expanders I bought to do it the other way, but this seemed a touch more efficient . For a larger scale project I might go the I/O expander route, but with a prototype I didn't want to necessarily soder and then, upon finding that I'd done it wrong, de-soder and then soder again. I have steady hands, but I don't know if I have "soder 100 tiny wires to tiny boards" steady. They say "Yes, but it works." They might work on fixing the code to streamline it. I'm not sure what you're asking on the other part of your question. Could you elaborate? So first: I am not a programmer, I'm just passing along what my programmer is telling me. If you have any questions, I'll check with them and see what they have to say about it. I will try and have a empty Unity project up tomorrow with this already in place, but this code will help for anyone that is not using Unity. This is the code on the Arduino that's sending out the serial data. Please share your code/projects if you've found a way to make it work with non-Unity engines! Hey Dave! Sorry about that, I didn't realize the email address was wrong and fixed it. It's amandalhudgins at gmail.com (forgot the a on my own first name, as it were). I can send you the code , just be sure to share it with others who may need it if you find a solution. Hey, I just wanted to create a thread for people who might be looking to join a team for the jam.